Inspired by the possibilities of narrative, the essays in this direction-setting volume present stories drawn from a range of ethnographic contexts. Stories of illness and healing are often arresting in their power, and they can illuminate aspects of practices and experiences surrounding illness that might otherwise be neglected. Recognizing the value of increased theoretical consciousness among those eliciting and analyzing narratives, these contributors explore narrative from a variety of perspectives. Cheryl Mattingly is Professor in the Department of Anthropology and the Department of Occupational Science at the University of Southern California. She has published extensively on narrative and received the Polgar Prize from the Society for Medical Anthropology in 1999. 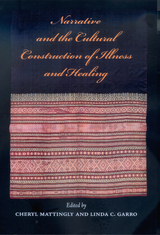 Her most recent book is Healing Dramas and Clinical Plots (1998). Linda C. Garro is Professor of Anthropology at the University of California, Los Angeles. Recipient of the Stirling Award from the Society for Psychological Anthropology in 1999, she has published widely in medical, cognitive, and psychological anthropology.